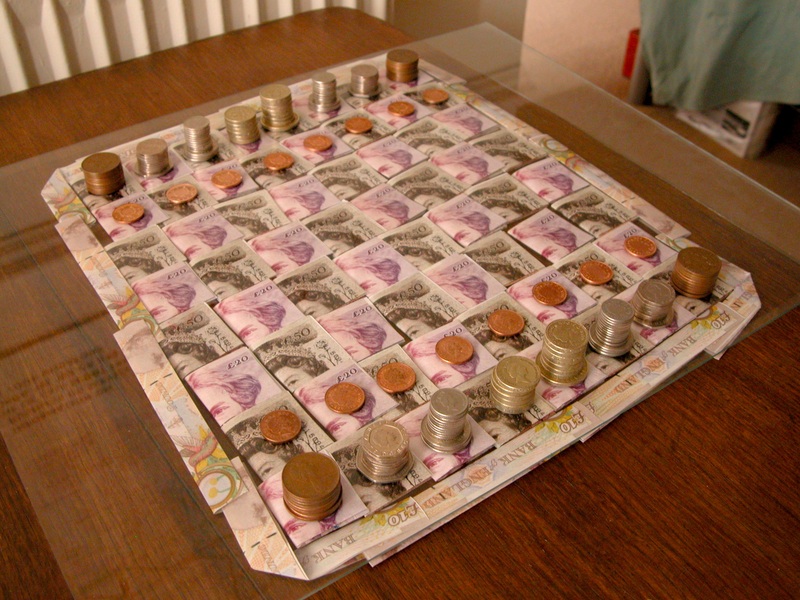 I made a chess set using only money. Notes for the board, coins for the pieces. Total cost: £2,402.68. I can't remember when or from where this idea originates. All I do know is that it was finally realized on Saturday 23rd August, after saving up a lot of money. The principle is simple, collect all your loose change to use for the pieces, and visit the bank to withdraw notes, and fold up them to build the individual squares. This alone, is a cool idea, but I wanted it to be more special, so I designed each piece using coins that I considered would specifically, and artistically, represent the piece and its historical and gameplay purpose. And instead of white and black, the opposing sides would be called 'heads' and 'tails'.